Did you know that you’re not destined to lose your adult teeth as you grow older? Given the frequency with which it occurs, it’s understandable that many people view permanent tooth loss as simply another inconvenience of age. However, the truth is that your teeth have the potential to last for a lifetime, and in most cases, they can, with proper maintenance and professional dental care. Rather than plan on which type of replacement teeth you’d prefer to wear in your golden years, you can increase your chances of preventing tooth loss and preserving your natural smile, instead. 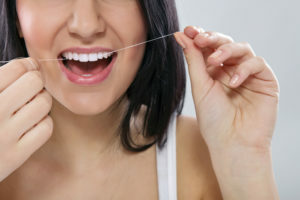 Brushing and flossing your teeth at least twice every day is recommended for more than just keeping your breath fresh. The dental plaque that sticks to your teeth every day is comprised of myriad masses of oral bacteria, many of which contribute to tooth decay and gum disease development. Neglecting good hygiene can allow germs to overwhelm your smile, and the issues that arise can cost you one or more teeth if not treated in time. Opening a bottle with your teeth might seem like a neat trick, but it’s actually a traumatic experience for your teeth. So is chewing on ice, nervously chomping your pen or pencil, and other destructive dental habits that place your teeth under excessive amounts of pressure. Reduce your risks of cracked, fractured, broken, and lost teeth by using them only for eating, and not for miscellaneous chores. You could brush your teeth four or five times a day, including after every single meal, and still develop a dental issue if you don’t pay attention during your hygiene routine. Plaque and its incumbent bacteria cling to every surface of your teeth, including along your gum line, and if you carelessly pass your brush across them, you may miss more than one spot. After a while, plaque hardens into tartar, and can no longer be removed with your toothbrush, allowing harmful oral bacteria a more potent shield behind which they can multiply and grow.